d i v e r s i t y w o m a n . c o m S u m m e r 2 0 1 7 D I V E R S I T Y W O M A N 37 When it comes to no pain, no gain— just don't do it. Though a solid, sweaty workout that leaves you short of breath is generally a good thing, pushing yourself to the limits of your endurance and past the pain threshold is not. Muscle soreness after a workout is fine. It means you are increasing strength in that area, espe- cially if you are new to exercising. But muscle pain during or after a workout generally means you are injured or on the way. Instead, the goal is to make sure your workouts are challenging and that you slowly increase the intensity—but al- ways stop before you reach the point of pain and discomfort. Not only can pushing beyond your lim- its be painful, but it can also be discour- aging. What fun is pain? It could lead you to stop exercising. Talk about no gain. THINKSTOCKPHOTOS DW Life > DW Life > A good place to start is to clear away the debris of some exercise myths. Along with the multitude of new forms of exercise has come a rash of claims, not all of them true. Below are seven common exercise myths. As a physical activity program should be individualized based on a person's age, weight, family health history, and a host of other factors, make sure to talk to your doctor before launching into a new exer- cise regimen. Myth #1 "No pain, no gain" We have Jane Fonda to thank for this exercise myth that, thankfully, has begun to run its course. Back in the day (in this case 1982), Fonda would use this catch- phrase in her aerobic workout videos. Soon, shoe companies, personal trainers, and others in the field joined the pushing- past-your-pain-threshold bandwagon. 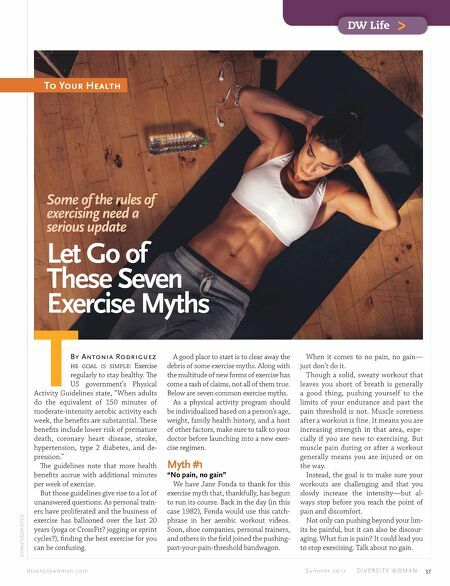 To Your Health Let Go of These Seven Exercise Myths Some of the rules of exercising need a serious update By Antonia Rodr iguez T he goal is simple: Exercise regularly to stay healthy. e US government's Physical Activity Guidelines state, "When adults do the equivalent of 150 minutes of moderate-intensity aerobic activity each week, the benefits are substantial. ese benefits include lower risk of premature death, coronary heart disease, stroke, hypertension, type 2 diabetes, and de- pression." e guidelines note that more health benefits accrue with additional minutes per week of exercise. But those guidelines give rise to a lot of unanswered questions. As personal train- ers have proliferated and the business of exercise has ballooned over the last 20 years (yoga or CrossFit? jogging or sprint cycles? ), finding the best exercise for you can be confusing.